The Dolomites are a magnificent alpine range stretching over two regions of Northern Italy: The northern part of the region of Veneto and the eastern section of Trentino-Alto Adige. The Dolomites have been designated by UNESCO as a World Natural Heritage Site. Resorts of the Dolomite valleys are ideal for downhill and cross country skiing in the winter and hiking and climbing in the summer. Bolzano, a city of 100,000, is the natural port of entry to much of the region and noted for its high quality of life among Italian cites. Access by car is provided by the north-south Autostrada A22. There is also Bolzano Airport (BZO) with flights to Rome, Milan and other destinations. Cortina d'Ampezzo is the hub of the Dolomites. It has been called the world's most beautiful winter resort. Cortina has neither a commercial airport nor a railroad station. Wikitravel has information on how to get there. 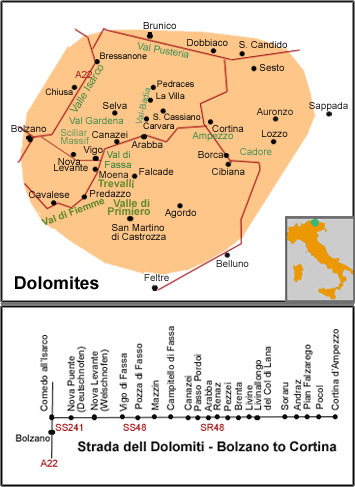 The Dolomiti Superski is a skipass to a dozen world class Dolomite ski locations. Among these superb ski areas are Valle Isarco, Val Gardena, Val di Fassa, Obereggen, Trevalli and S. Martino di Castrozza. For the sightseer there is the Grande Strada dell Dolomiti, the Dolomite Road which offers magnificent views of the alpine landscape. 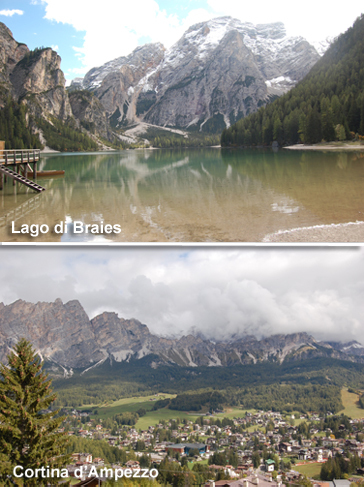 The trip from Bolzano to Cortina d'Ampezzo takes three hours.